Are you worried that the noise from shooting your firearm might be affecting your hearing? You are right to be concerned! As you will see when reading this article, your ears can be permanently affected if you do not wear appropriate security when shooting your gun. We will advise you about the best ear protection for shooting. To start off with, we have created a table that lists some options that you can consider. Further down the article, we dive deeper into each option to help you determine which option might work best for you. Overall, the best ear protection for shooting is to combine the options available to you by wearing earplugs and earmuffs together. By doing this, you actually combine the safeguard of them. As an example, if your earplugs reduce noise by 26 decibels and your earflaps reduces it by 34 decibels, together they will reduce it by approximately 41 decibels. To decrease the high decibel levels that you are exposed to even further, you can fit a suppressor to your gun for the maximum safety. 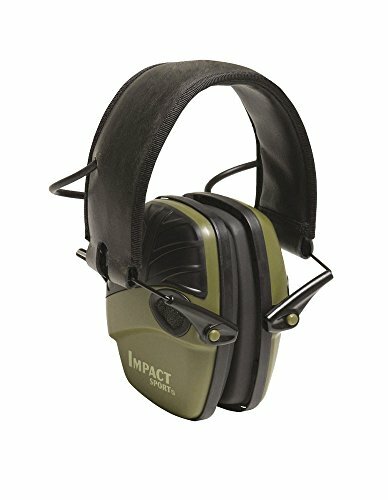 What is the best ear protection for shooting? We are all exposed to ever-increasing noise in our everyday lives. Traffic, television, radio and even household appliance all contribute to a lot of noise that our ears are taking in. The National Institute on Deafness and Other Communication Disorders (NIDCD) estimates that approximately 15% of Americans between the ages of 20 and 69 (or 26 million Americans) have hearing loss that may have been caused by exposure to noise at work or in leisure activities. So if noise from everyday life is having such an impact on people’s ears, what impact will be shooting a gun have on you? The sound is measured in units called decibels (dB). To give you an idea of the sound levels of every day, a normal conversation is measured at approximately 60 decibels and a lawnmower at approximately 90 decibels. However, a shot from a 9mm pistol is approximately 160 decibels! That is even louder than a jet taking off, which is measured at approximately 140 decibels. This shows that gunshots are not just loud, but that they are very loud. So what is the big deal? We can handle it, right? Actually, our ears cannot handle such loud sound repeatedly or for extended periods of time. Research has shown that when a person is repeatedly exposed to levels of 85 decibels or more, a person can start suffering what is known as noise-induced hearing loss (NIHL), while exposed to levels of 140 decibels or more can cause immediate nerve damage. So that means if we fire a shot from a gun, which is generally above the 140-decibel level, without any safety then we will inflict immediate damage. Below we show a graph of some common noises and how the sound from gunshots compare. As you can see, gunshots are generally way over the 140-decibel threshold. Many folks have the opinion that they will take the chance and fire the occasional shot without worrying about what the effects might be. But an accurate analogy we found is boxing. Boxers take punches to their heads over the course of their careers, and usually, they recover from these punches shortly after their fights. However, in the long run, they can suffer permanent brain damage from all the punches that accumulated over the years. The same can be said of being exposed to the sound of gunshots. You may not notice any damage in the short term, but in the long term, you will feel the effects. And by then, it is probably too late to really do anything about it. Having difficulty distinguishing words when someone is talking to you. Having difficulty determining from which direction a sound is coming. A ringing or buzzing noise in your ears. If you think you have some serious damage caused to the way you hear, we really recommend that you go see your doctor make sure the extent of the damage and how to treat it. There are several options to choose from when it comes to selecting the best ear protection for shooting. Each option has their own specific benefits and disadvantages and may be more suitable for certain preferences over others. Most shooters simply use them when shooting. They’re incredibly cheap, disposable, easy to put in and take out, fit easily in a pocket or bag, and they’re commonly seen as the most comfortable option. They also don’t interfere with prescription and safety glasses. However, some folks don’t think they are the best ear protection for shooting as they can easily fall out, may not fit properly, to begin with, and allow more noise to come through. However as technology has progressed, there are no longer just pieces of foam that you plug into your ears. High-end earplugs are made from modern materials like medical-grade polymer that is soft, durable, and long-lasting. If you are not a regular or serious shooter, they will be the best ear protection for shooting as they are inexpensive and easy to use. Hunters will likely prefer them to earmuffs as they are more convenient to wear out on the hunting grounds, while still providing some protection. This option provides shooters with comfortable ear safety that provides excellent comfort as they have soft padding that fits over the ears. They also provide better trust from higher decibel levels but are of course generally more expensive than earplugs. If you are a regular shooter that wants better security than what earplugs can provide, but do not necessarily want to invest in expensive electronic earmuffs, then the passive option will the best hearing protection for shooting. This is the most expensive option by far with prices ranging from $60 to over $300, and they are viewed by many as the best hearing protection for shooting. One of the biggest benefits of this option is that the technology on them regulates sound. This allows you to able to hear regularly while you use them. You can hear warnings, conversation and more very clearly, When a sound above a certain decibel level is detected, they will automatically reduce it. They typically provide the best shelter from loud sounds, have volume adjustment, and some can be used as regular headphones with an audio jack. In the event that the batteries run dry, they can also function as regular passive ear muffs. The one main drawback is the high price. However, those who shoot on a very regular basis may find the investment well worth the money. On average, suppressors reduce the noise of a gunshot by 20 to 35 decibels (dB). The Hearing Protection Act (HPA) was introduced to remove suppressors from the purview of the National Firearms Act (If you want to read more about what the HPA entails, you can have a look at ASA article about it here). The HPA will make it easier for hunters and sportsmen to protect them in the 41 states where private suppressor ownership is currently legal, and the 37 states where hunting with a suppressor is legal. Now that you know of the benefits and drawbacks of each type, you should follow these key factors when selecting the best ear protection for shooting in terms of your own practices and preferences. The most important aspect to look for when searching for the best ear protection for shooting is a good noise reduction rating or NRR. The NRR is the official rating system for safety with ratings ranging from 0 to 33 decibels. The rating system may seem a little confusing, but it’s actually quite simple. The NRR rating in decibels is the number of decibels that is canceled out by the item. You merely subtract the rating from the decibel level of the firearm. For example, a .45 Colt produces around 155 decibels of noise. If you had security with a rating of 30, you would actually only be exposed to 125 decibels of sound. Prolonged exposure to these levels may still cause some damage, but one exposure to the high decibel levels without defense can immediately cause permanent damage. The higher the rating, the better. Is the best safety for shooting also the most expensive option? If you don’t shoot very regularly, earplugs can be a great option as they’re quite cheap. You can get a pack of them for a couple of Dollars. However if you shoot more regularly, you’d find more benefit in putting up the extra money for some passive ear muffs. These run around $20 to $30, and they can last for many years if you take care of them well. Very serious shooters may benefit most from investing in electronic ear muffs as they provide many benefits that would be great for sport shooters and avid hunters. These can be a great option to anyone if you can afford it, but they’d be most useful for people who shoot on a very regular basis. Safety is typically worn for fairly long periods of time. The best ear protection for shooting should be very comfortable to ensure that they won’t become irritating or even painful over time. Choose very soft and moldable ear plugs, ensure that ear muffs have sufficient padding, and choose options that fit well and can be adjusted easily. Choosing a color for your ears custody is more than just personal preference. Camouflage can be beneficial in keeping hunters hidden from prey while bright colors can allow other shooters to spot you from far away, creating a safer shooting environment. Finding a color that creates additional benefits to your hunting or shooting is vital in finding the best ear protection for shooting. Keeping the NRR score, comfort and overall effectiveness in mind, we look at the best ears care options in terms of earplugs, passive earmuffs and electronic options. We briefly eluded to the fact that earplugs are not just foamy things you put into your ear anymore. The technology has evolved so that they are not only comfortable, but effective too. Let’s look at some of the options. If you want the traditional foam option, these from Hearos are a good option. They are listed to have a NRR of 33 dB, which is pretty much the highest NRR that you will get from them. You get a packet of 14 pairs, so you can keep it in your kit bag when you go hunting or to the range so you will always have some security on hand. These are slightly larger than other though to ensure a tighter fit in your ear. So don’t be too worried if they feel a bit big in your ears when you put them in for the first time. These are ideal for shooters who need to be able to put their in and take then out on a regular basis. With its patented band design, you can take them out and let them hang around your neck when you don’t need them. If you don’t want to use earmuffs when you are out hunting, but still want some form of caring then these are possibly the best ear protection for shooting for you. With a NRR of 25 dB, they are not as effective as some of the other options out there, but offers a unique convenience that regular earplugs do not. The foam pods offer good comfort and are also replaceable. Just make sure you wear them the correct way, as some users have complained about their effectiveness. However, it is likely these users wore the earplugs the wrong way. There are generally more expensive than earplugs, but usually, offer more trust. This option is for serious ears security. The cups used are deeper and heavier than some other earmuffs’ cups, but this results in a NRR of 31 dB! Unfortunately, the deep cups do mean that some folks might struggle to use them when trying to shoot with certain rifles (but this will typically depend on which rifle you are shooting with, the stock of the rifle, etc.). 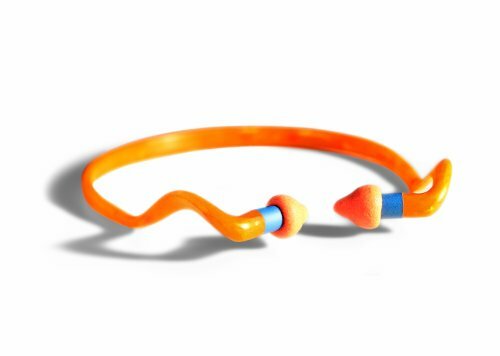 Something that we really like about this option is the twin headband design, which helps reduce heat build-up. So if you are looking for a passive option that provides maximum safety and that you can wear for extended periods of time, then these are perhaps the best ear protection for shooting for you. 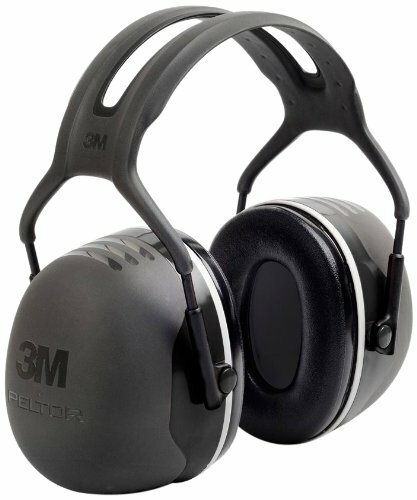 If you do not like the bulkiness of the 3M Peltor, then these super slim from Howard Leight might just be the best ear protection for shooting for you. They weigh considerably less than the 3M Peltor and have an overall slim design. Of course, the cost of that is that they have a lower NRR than the 3M Peltor, with an NRR of 23 dB. Similar to the 3M Peltor, these from Howard Leight offer excellent comfort so you can wear them for extended periods of time. If you are a serious shooter and want the best ear protection for shooting out there, then you need to invest in a solid pair of electronic earflaps. They definitely cost more than other options but offer so much more in the form of the sound management technology that comes with it. If you are a hunter that need to be able to hear your game, or a shooter at the range that need to be able to hear the range safety officer, and are serious about protecting your hearing then these are the ones that will probably be the best ear protection for shooting for you. Why do we say that? It has a NRR of 22 dB and provides 4 x amplification, which means it protects you against noises above 82 dB while amplifying lower sound levels (such as the sounds from the game or the voice of a person trying to talk to you). Combine this with its sleek design, these pieces are perfect to use with rifle stocks when out hunting. It also comes with an auxiliary jack so that you can plug it into a MP3 player if you want to. If we were buying electronic earflaps, these are what we would buy. What Do You Think – What Is The Best Ear Protection for Shooting? There will be different opinions on what the best ear protection for shooting is, however from the research conducted by leading medical institutions it is clear that when you go shooting, even for just a little bit, you need to consider what the best care for you will be. If you have some thoughts on the topics, we would love to hear it! Please leave a comment in the comments section on what you think the best ear protection for shooting is.